Well, today is actually a good day for me to sit at my computer at length, and I haven’t wanted to keel over due to the heat. Working on getting the AC fixed, or at least watching while it is, and there were days earlier this week it was 93 inside. At 2:30 AM. At my computer. This has put a major dampening on my computer activities (although not exactly computer silent either). And the enthusiasm I had built up on sunday just prior to all this chaos has sorta slipped away. Had a great time at the quilt show, and will share it with you audibly with you soon! In the mean time, lots more hand sewing while I sit in a 10 X10 (or so) room watching TV and some of the Harry Potter movies. I’m up to HP4 rewatched now, and yes, the premiere is tomorrow (tonight), but I have tickets for Monday afternoon, so I have time to watch the remaining 3 movies beforehand. Here are the tribbles I’ve been working on. They even did me the honor of lining up for me. And what do you know, 12 more decided to show up on the table after this picture was taken. I told you they multiply! Actually, this picture doesn’t look too far off of what the periodic table actually is … which is a good thing. I have lots and lots of tribble seeds still thanks to Pam and several members of my wonderful guild! They’re so addicting to do that a few more tribble skeletons (not sure if they have skeletons?) also followed me home yesterday, to the size of 3/4 and 1 inch. 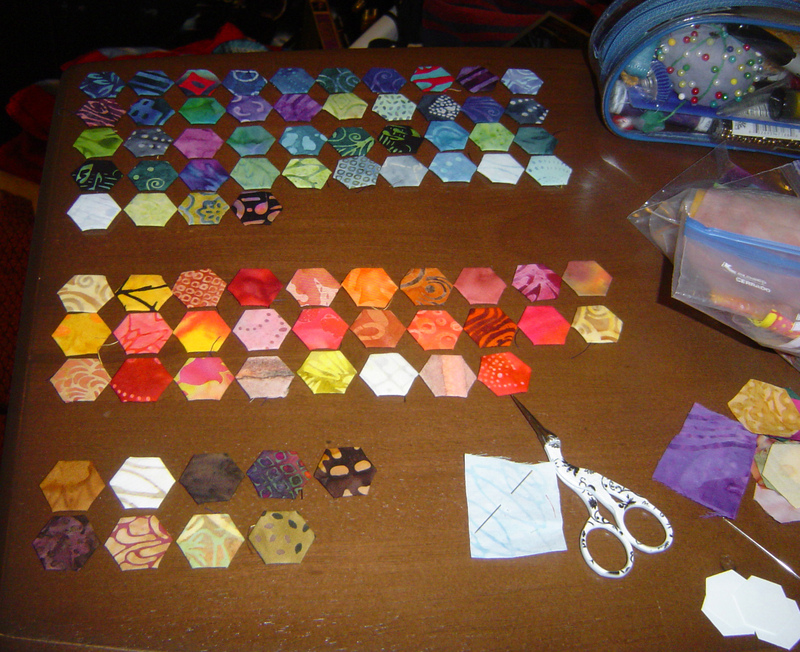 (These are 1/2 inch along each hexie side). Love them!!! They are really addicting aren’t they?!? Love the batiks! Oh man, I’ve been trying to hold off on trying to make up a bunch of these… Hexagon quilts always look so neat. I may have to just give in and try it now. I have added to these a little bit, but I know the brown one you mention is pretty cool!